The cab is now resplendent in BR green. De-rusting and a coat of preventative primer took place out of doors by our own team and the cab was then moved into the Bridgnorth paint shop and placed into the expert care of Andy Williams and Gary Townley. 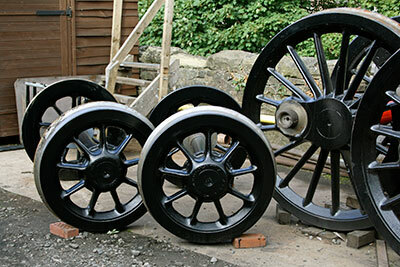 In the meantime Colin Williams and Gareth Price have taken the lead in painting the pony wheels black and also in touching up the paintwork on various parts of the loco’s chassis. 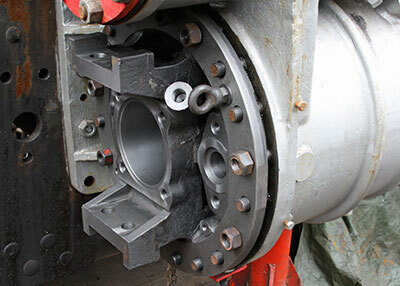 The machining of the horn guides has moved on quite quickly since the last news update with all the centre and leading axle horn guides attended to and those on the trailing axle drawing towards completion at the time of writing. Various additional holes have appeared in the smokebox wrapper, the more obvious ones being those for the chimney and vacuum ejector exhaust. Following a recent pause in boiler activities as far as 82045 was concerned whilst various boilers were moved around within the boilershop, work has resumed with a member of the full time staff taking on the task. 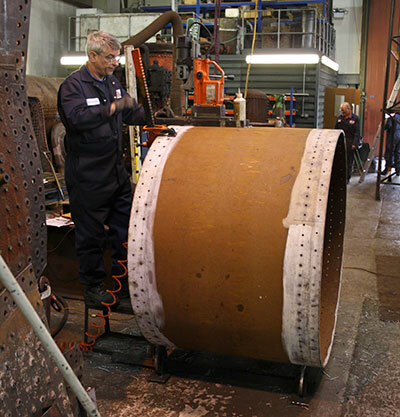 The rivet holes have been drilled in the shorter parallel boiler barrel and at the time of writing further swaging of the small end of the taper barrel had taken place to allow the parallel section to be fitted into it. 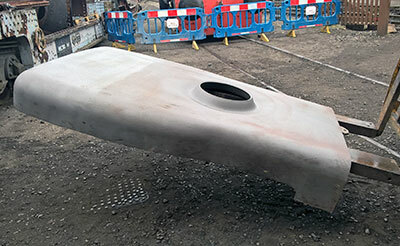 South Devon Railway Engineering have been busy manufacturing the various component parts of the firebox. The first bit has arrived at Bridgnorth, this is the back head (or door plate, which ever you want to call it) for the steel outer firebox. Further to August's notes, we can confirm that the SVR Raffle, in combination with an appeal to shareholders and further boosted by cash donations, has generated over £30,000 for 82045. Once again, very many thanks to all those friends who organised and supported the raffle and appeal - this is a fantastic result. We had a low-profile presence at Bridgnorth for only part of the event, as it was felt that it wasn't really our "bag". However, I was delighted with the complimentary remarks made about 82045 by many of those visitors to the SVR who did filter down to our site, and was able to tell them that there is plenty more going on behind the scenes. Tony reports on the splendidly painted cab in his notes, and a number of people asked where this was. The finished job looks beautiful, though it will not be lined-out until the side tanks are fitted, since the lining of the cab is integral with that of the tanks. I'd also like to pay tribute to our blokes who worked long and hard on preparing the cab for its visit to the paint shop, in particular Bryan Clarke, Martin Managhan, Gareth Price and Colin Williams. Thanks chaps! The cab will be back in situ soon (watch this space). For those of you who don't receive the Newsletter, the AGM has been fixed for Saturday 8th April in the upstairs lecture theatre at Kidderminster Railway Museum, starting at 2.00 p.m.. All are welcome, and you don't have to be a member to attend. Our new 2017 calendar has arrived and may be purchased from Barbara at a cost of £6.00 + £1.25 p&p. The new look calendar is in full colour and pictures various stages of 82045's construction. 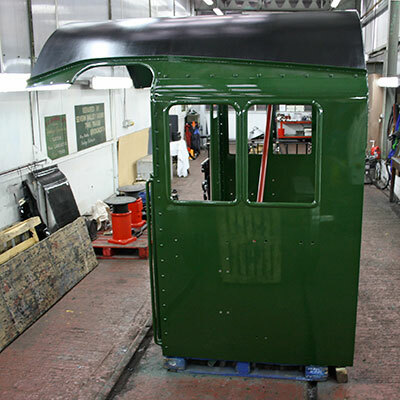 The newly painted cab in the paint shop. Such a high gloss finish has been acheived that reflections from the workshop can be seen in the cab side! Photo: Tony Massau. The pony wheels now painted gloss black. Photo: Tony Massau. Rab Anderson drilling rivet holes in the short parallel section of boiler barrel. Photo: Tony Massau. 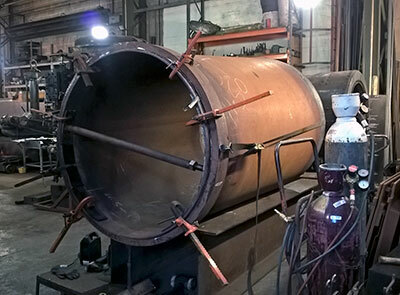 The taper boiler barrel following further swaging of the smaller end truly circular. Photo by Peter Line. 82045 boiler fire hole plate at Bridgnorth, manufactured by South Devon Railway Engineering. Photo by Peter Line. The newly machined rear cylinder cover, right hand side of loco. Photo: Tony Massau.